The QR Code Web Part is a SharePoint client side web part built with the SharePoint Framework (SPFx). 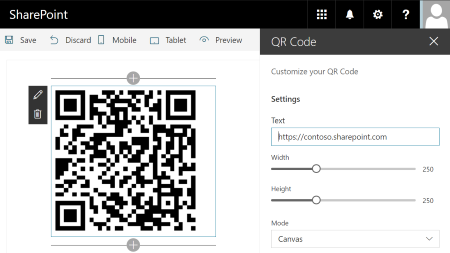 This web part generates QR Codes in SharePoint pages. You can edit it and modify, text, with, height, etc. This web part uses jquery-qrcode.js lib.